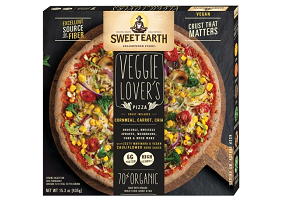 Global consumer goods firm Nestle has announced the addition of a pizza line to its Sweet Earth brand of plant-based foods in the USA. Offering “pizza enlightenment”, the new line of frozen pizzas provides “wholesome, craveable flavors made with organic ingredients” as well as “unique crusts blended with ancient grains, carrot and rosemary, bold sauces, and fresh toppings”. Launching across the US, the Sweet Earth pizza line comprises Veggie Lover’s, featuring a cornmeal, carrot and chia crust, and described as the first-ever frozen pizza topped with brussels sprouts; Protein Lover’s, which contains 16g of protein per serving and is topped with smoked mozzarella, marinara sauce and meat-free ‘pepperoni’; Truffle Lover’s, featuring mushrooms, caramelized onions, truffle oil and gruyere cheese; and Herb Lover’s, which is topped with five cheeses and a lemony herb pesto sauce, and has a rosemary crust. Commenting on the launch, Sweet Earth Foods CEO Kelly Swette said: “We believe food should be delicious, but it should also make you feel good past the moment you’re eating it. Our new pizzas are chock-full of fresh ingredients that provide exceptional taste and nutrition, with the convenience that comes in the freezer aisle. We’re making healthy and sustainable food accessible to everyone, just like it should be”.